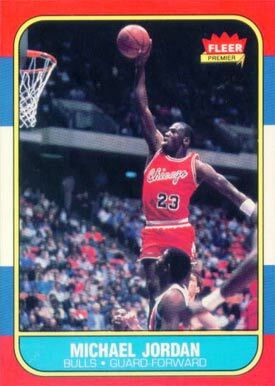 The 1986 Fleer Michael Jordan rookie card is arguably the most important basketball card in the hobby. The set single-handedly made basketball cards relevant again after interest died down in the early 1980's. The card is easy to find but if you want to own one in pristine, gem mint condition then you should expect to pay big bucks for a copy. Tens of thousands of dollars actually. That puts it high on the list of the most valuable basketball cards in the hobby. But be careful: because it's such a popular card it's also frequently counterfeited. Are you selling Michael Jordan rookie cards? The first thing most collectors ask is: how much is a Michael Jordan rookie card worth? Currently, Jordan rookie cards in PSA 10 holders are typically selling between $18,000 and $20,000. That's a big discount from when they were selling for over $30,000. In a BGS 9.5 holder you can expect to pay between $7,500 and $10,000. How do buyers and sellers determine the value of a Michael Jordan rookie card? This may seem obvious but you need to be sure it's also a genuine Jordan rookie card and not a counterfeit. And professionally graded cards are one of your best defenses against buying a counterfeited copy. Even though it's expensive and highly sought after, it's really not all that scarce and difficult to find in high grade. As mentioned previously, Jordan's legacy and the importance of the 1886 Fleer basketball card set are the key value drivers. The front of the card shows Jordan flying high above the rim on his way for a dunk. It's an image repeated so many times during his career. The red, white, and blue border on the card makes it instantly recognizable. There really isn't another basketball card that looks quite like it. Those multi-colored borders do make it a challenge to find the card without signs of wear and chipping. And, unfortunately, centering can be a problem for collectors as well. The back of the card also has its own centering challenges. Even if the front of the card is nicely centered, always check the reverse side before buying as it can be off-center. It's also not too interesting to look at compared to other sports cards. There are a couple of stat lines and personal information about Jordan to accompany them but other than that the reverse side is rather plain. It would have been cool to see a few facts or short write-up common on other sports cards. But, it's still an amazing card so it's hard to complain! It's the key card to the entire 1986 Fleer basketball card set and the standout of a group of other well-known rookies such as Charles Barkley, Clyde Drexler, Karl Malone, Chris Mullin, Hakeem Olajuwon, Patrick Ewing, Isaih Thomas and Dominique Wilkins among others. Jordan spent 15 years in the NBA for the Chicago Bulls and Washington Wizards dominating opposing defenders. Many consider him the greatest to ever play the game. He led the Bulls to six NBA titles by achieving two "3-peats" from 1991-1993 and 1996-1998. Jordan racked up five NBA Most Valuable Player Awards, ten All-NBA First Team votes, nine All-Defensive First Team honors, fourteen NBA All-Star appearances, three All-Star Game MVP awards, ten scoring titles, three steals titles and six NBA Finals MVP awards. His list of accomplishments is nothing short of jaw-dropping. He was enshrined into the NBA Hall of Fame in 2009 for his achievements and contribution to the game. That's what makes the Michael Jordan rookie card so collectible.